Distribution: The Australian jewfish or mulloway is a large predator found inshore around rocky shores and in estuaries. They are also found on offshore reefs and like all members of the family, jewfish love rocks and ledges, culverts, pipes, bridge pilings and shipwrecks as potential homes. On rocky shores the fish are often found in caves and gullies especially under white water. The fish rest in these places during the day and hunt at night. Description: Mulloway is the aboriginal name for ‘the greatest one’. Mulloway are indeed one of our greatest scalefish and are easily distinguished from other fish through their metallic silver / bronze sheen, shield like scales and concave (outward fanning) tail. They grow to a large size, with fish up to 30kg common and some records of fish up to 40kg. Ecology: Ecology Jewfish mostly eat small fish, squid ,crustaceans and polycheates. They’re not very picky eaters. They gather in large numbers for spawning which makes them vulnerable to over-fishing. Mulloway generally spawn in marine waters just outside of the surf zone and the egg larval development occurs at sea, with juveniles settling in estuarine nursery areas until a length of 46cm is reached, in about three to four years. A 10kg mulloway is likely to be about six to seven years of age. They are thought to live for a maximum of about 30 years. Mulloway are believed to reach sexual maturity at a length of about 75cm, although this has not been verified for Australian waters. 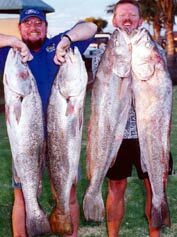 Mulloway are opportunistic predators, feeding on a variety of fish, molluscs and crustaceans. Interesting facts: Another name used to describe mulloway is ‘butterfish’ which relates to the yellow butter-like lather that mulloway apparently produce on the surface of the seawater during spawning.